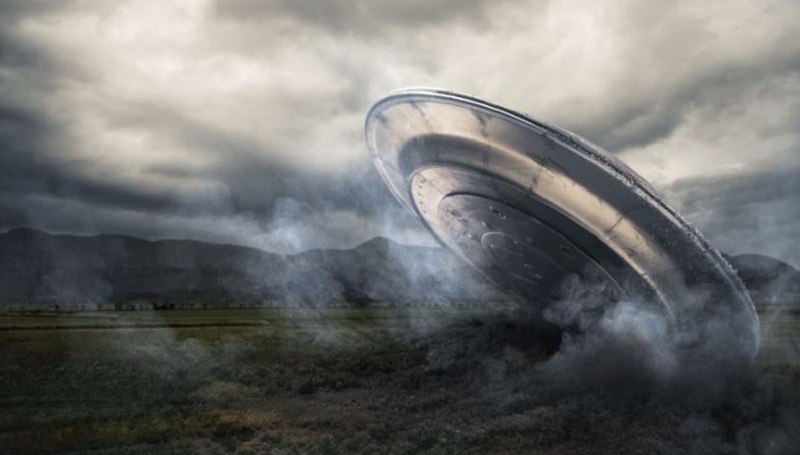 Surviving aliens allegedly attacked and killed Russian military after the latter shot down the former, revealed in a sensational declassified CIA report. 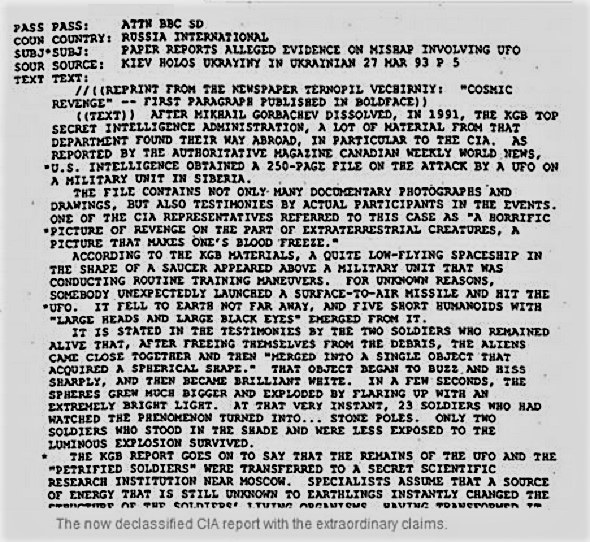 The report stated that a military unit noticed a low flying saucer while in training in Siberia. One of the soldiers then fired a surface to air missile, bringing the UFO down, the report said. It further indicated that five short humanoids, having large heads and huge black eyes, got out. Two survivor soldiers saw the five beings transformed into a white spherical ball of light, buzzed and hissed. The ball of light then exploded and turned 23 soldiers into stone, the report claimed. Two troops in a shaded area survived the alleged attack. The report added that the remains of the petrified soldiers were transported to a secret research institution near Moscow as per KGB report. NOTE: The above image is CGI. This entry was posted in ABDUCTION, best ufo photos, incredible ufo photos, MISSING TIME, top ufo news, UFO, UFO ARTICLES, ufo news, ufo photos and tagged 23 SOLDIERS KILLED, ALIEN PHOTO, alien sphere. ufo sphere, best ufo photos, CIGAR UFO, cloaking ufo, close encounter, DISC, DISC ENCOUNTER, FLYING SAUCER, incredible ufo photos, largest ufo web site, LIGHT, LIGHTS, MARCH 1993 SERBIA UFO, MISSING TIME, MOON UFO, ORB, ORBS, pyramid ufo, radio ken Pfeifer, rectangle ufo, RUSSINA SOLDIERS UFO KILLED, saucer, SERBIA UFO CLOSE ENCOUNTER, SPACE ENCOUNTER, sphere, SPHERE UFO, STRANGE, swamp gas, top ufo news, TRIANGLE, ufo, UFO ARTICLES, ufo crash, UFO DISC, ufo news, UFO PH, ufo photos | Tagged ABDUCTION, ufo photos | Tagged air force ufo, ufo photos | Tagged alien disc, ufo photos | Tagged best ufo photos, ufo photos | Tagged biggest ufo web site, ufo photos | Tagged CYLINDER, ufo presidents, UFO TRIANGLE, UFO world ufo photos by KEN PFEIFER. Bookmark the permalink. Hi! This is my 1st comment here so I just wanted to give a quick shout out and say I genuinely enjoy reading through your articles. Can you suggest any other blogs/websites/forums that deal with the same subjects? Thanks a lot! I simply want to mention I am just beginner to blogs and actually enjoyed your blog. Very likely I’m planning to bookmark your blog . You amazingly have very good article content. Thanks a lot for sharing your webpage. I would like to thnkx for the efforts you’ve put in writing this blog. I am hoping the same high-grade website post from you in the upcoming as well. Actually your creative writing skills has encouraged me to get my own website now. Really the blogging is spreading its wings quickly. Your write up is a great example of it.